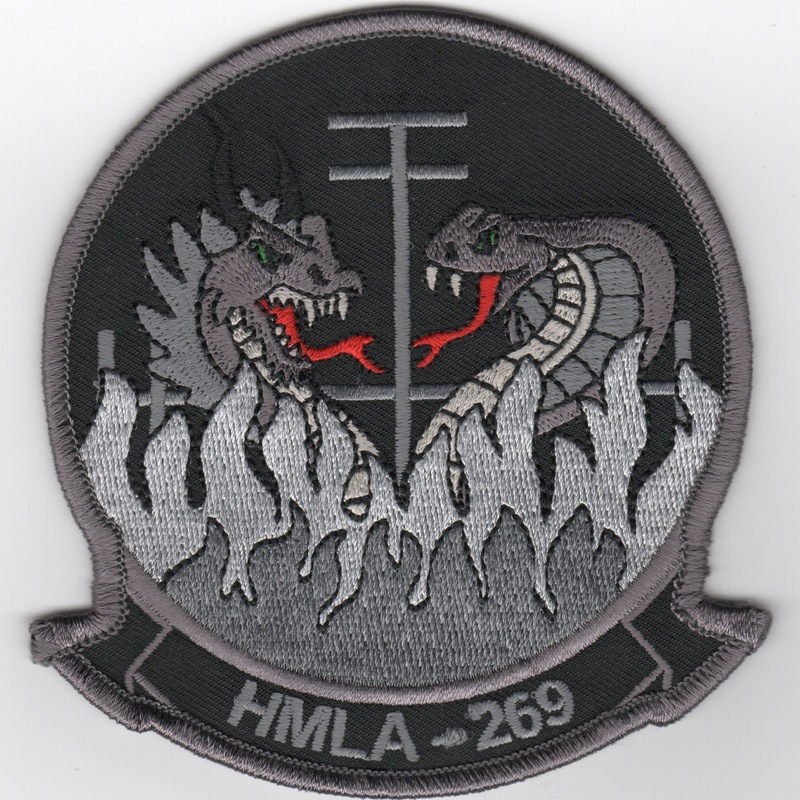 This is the color version of the squadron patch for HMLA-269 that shows 2 "different" dragons facing each other. HMLA-269 is a United States Marine Corps helicopter squadron consisting of AH-1W SuperCobra attack helicopters and UH-1Y Venom utility helicopters. Also known as "The Gunrunners", the squadron is based at Marine Corps Air Station New River, North Carolina and falls under the command of Marine Aircraft Group 29 (MAG-29) and the 2nd Marine Aircraft Wing (2nd MAW). 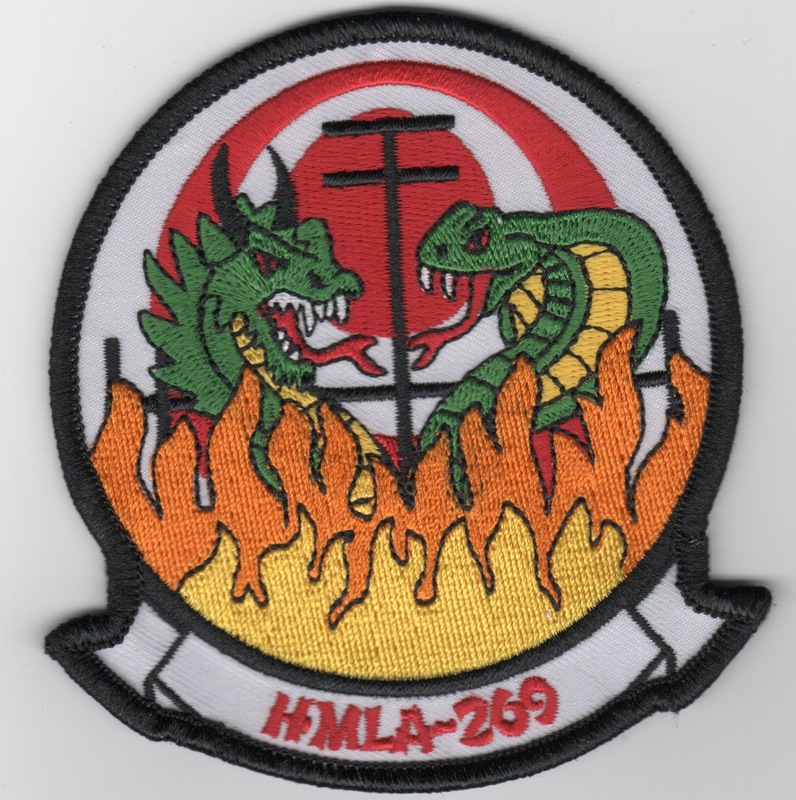 This is the color PVC version of the squadron patch for HMLA-269 that shows 2 "different" dragons facing each other. HMLA-269 is a United States Marine Corps helicopter squadron consisting of AH-1W SuperCobra attack helicopters and UH-1Y Venom utility helicopters. Also known as "The Gunrunners", the squadron is based at Marine Corps Air Station New River, North Carolina and falls under the command of Marine Aircraft Group 29 (MAG-29) and the 2nd Marine Aircraft Wing (2nd MAW). This is the desert version of the squadron patch for HMLA-269. HMLA-269 is a United States Marine Corps helicopter squadron consisting of AH-1W SuperCobra attack helicopters and UH-1Y Venom utility helicopters. Also known as "The Gunrunners", the squadron is based at Marine Corps Air Station New River, North Carolina and falls under the command of Marine Aircraft Group 29 (MAG-29) and the 2nd Marine Aircraft Wing (2nd MAW). This is the black version of the squadron patch for HMLA-269. HMLA-269 is a United States Marine Corps helicopter squadron consisting of AH-1W SuperCobra attack helicopters and UH-1Y Venom utility helicopters. Also known as "The Gunrunners", the squadron is based at Marine Corps Air Station New River, North Carolina and falls under the command of Marine Aircraft Group 29 (MAG-29) and the 2nd Marine Aircraft Wing (2nd MAW). 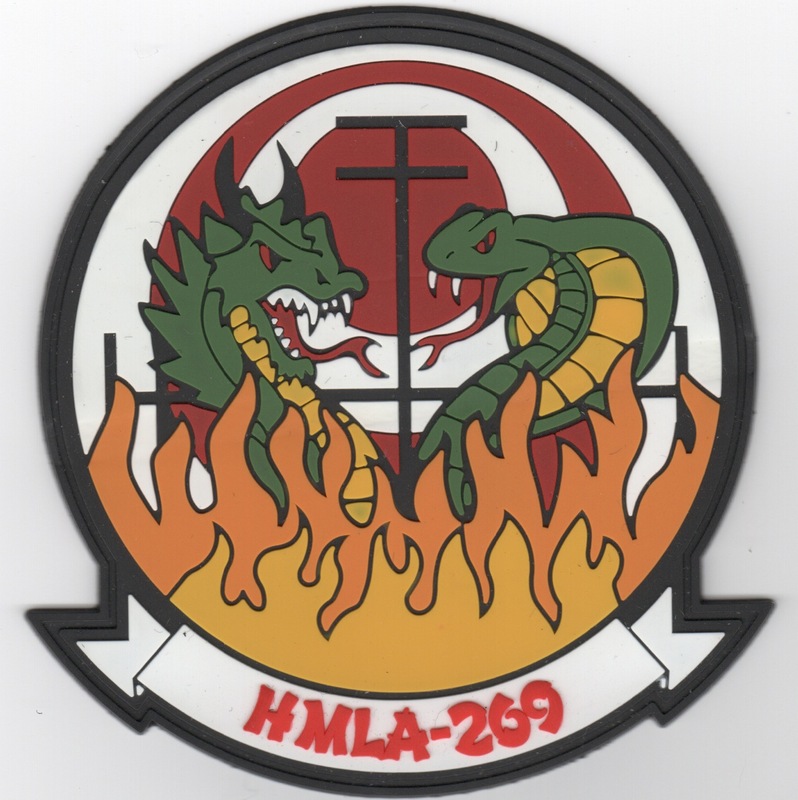 This is the black version (with red lettering) of the squadron patch for HMLA-269. HMLA-269 is a United States Marine Corps helicopter squadron consisting of AH-1W SuperCobra attack helicopters and UH-1Y Venom utility helicopters. Also known as "The Gunrunners", the squadron is based at Marine Corps Air Station New River, North Carolina and falls under the command of Marine Aircraft Group 29 (MAG-29) and the 2nd Marine Aircraft Wing (2nd MAW). This patch does not have velcro attached. 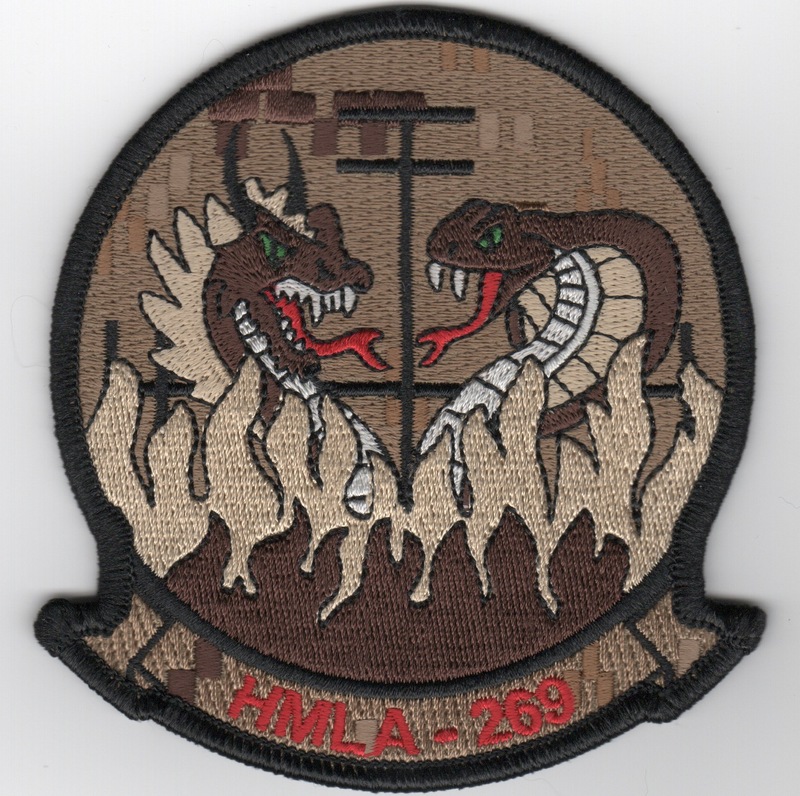 This is the black-bordered version of the squadron patch for HMLA-367. They are attached to MAG-39 located at MCAS Camp Pendleton. Their lineage is from VMO-351 (1943), then redesignated as VMO-3, 15 Jan 1944, then deactivated 20 August 1949. They were reactivated as VMO-3, 1 August 1966 and changed to HML-367, 24 March 1968. They were redesignated HMLA-367, 1 January 1988. This unit is a highly decorated unit from Vietnam to present with involvement from Southeast Asia Evac, April 1975 to the Operation Restore Hope - Somalia. This patch does NOT have the velcro on the back. This is the desert version of the squadron patch for HMLA-367. They are attached to MAG-39 located at MCAS Camp Pendleton. Their lineage is from VMO-351 (1943), then redesignated as VMO-3, 15 Jan 1944, then deactivated 20 August 1949. They were reactivated as VMO-3, 1 August 1966 and changed to HML-367, 24 March 1968. They were redesignated HMLA-367, 1 January 1988. This unit is a highly decorated unit from Vietnam to present with involvement from Southeast Asia Evac, April 1975 to the Operation Restore Hope - Somalia. 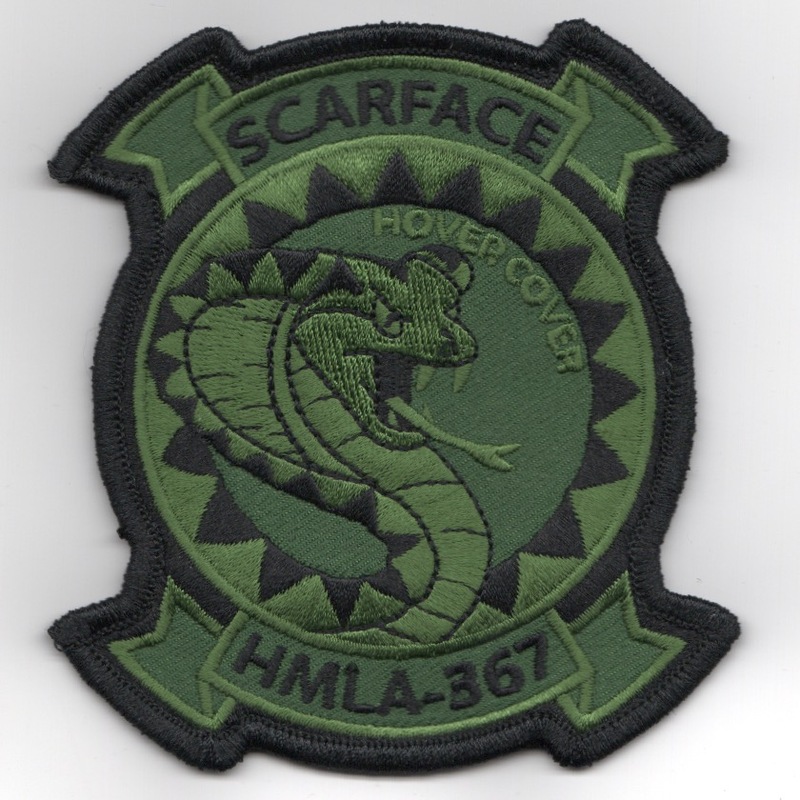 This is the desert version with the subdued green snakes for the squadron patch for HMLA-367. They are attached to MAG-39 located at MCAS Camp Pendleton. Their lineage is from VMO-351 (1943), then redesignated as VMO-3, 15 Jan 1944, then deactivated 20 August 1949. They were reactivated as VMO-3, 1 August 1966 and changed to HML-367, 24 March 1968. They were redesignated HMLA-367, 1 January 1988. This unit is a highly decorated unit from Vietnam to present with involvement from Southeast Asia Evac, April 1975 to the Operation Restore Hope - Somalia. This patch already has the velcro on the back. This is the Subdued version with the black border for the squadron patch for HMLA-367. They are attached to MAG-39 located at MCAS Camp Pendleton. Their lineage is from VMO-351 (1943), then redesignated as VMO-3, 15 Jan 1944, then deactivated 20 August 1949. They were reactivated as VMO-3, 1 August 1966 and changed to HML-367, 24 March 1968. They were redesignated HMLA-367, 1 January 1988. This unit is a highly decorated unit from Vietnam to present with involvement from Southeast Asia Evac, April 1975 to the Operation Restore Hope - Somalia. This patch does not have velcro on the back. This is the "gray" version of the squadron patch for HMLA-367. They are attached to MAG-39 located at MCAS Camp Pendleton. Their lineage is from VMO-351 (1943), then redesignated as VMO-3, 15 Jan 1944, then deactivated 20 August 1949. They were reactivated as VMO-3, 1 August 1966 and changed to HML-367, 24 March 1968. They were redesignated HMLA-367, 1 January 1988. This unit is a highly decorated unit from Vietnam to present with involvement from Southeast Asia Evac, April 1975 to the Operation Restore Hope - Somalia. This patch already has the velcro on the back. 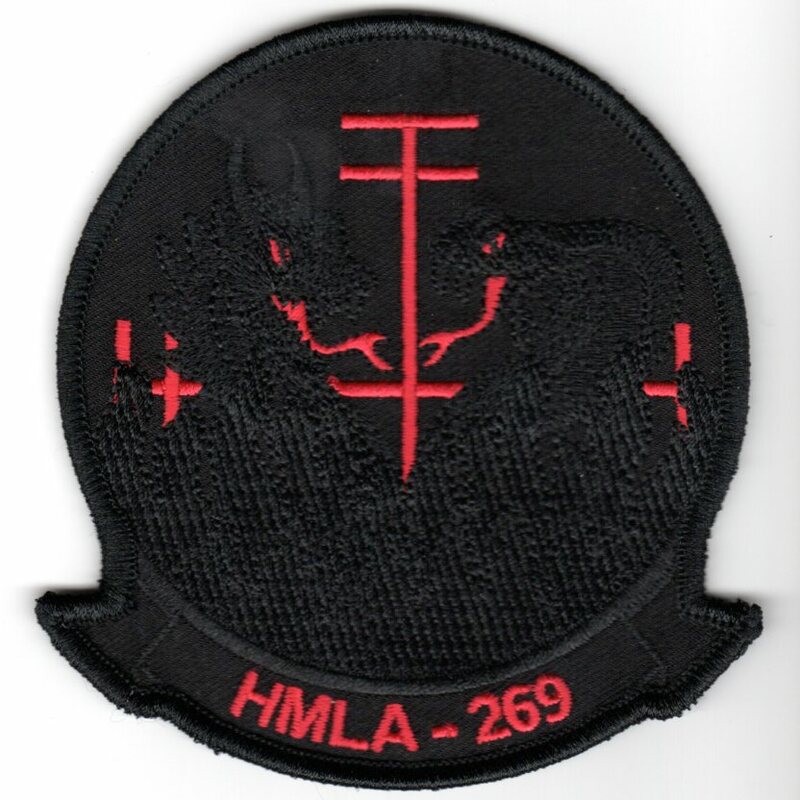 This is the "red" version of the "Hover Cover" series of patches for HMLA-367. They are attached to MAG-39 located at MCAS Camp Pendleton. Their lineage is from VMO-351 (1943), then redesignated as VMO-3, 15 Jan 1944, then deactivated 20 August 1949. They were reactivated as VMO-3, 1 August 1966 and changed to HML-367, 24 March 1968. They were redesignated HMLA-367, 1 January 1988. This unit is a highly decorated unit from Vietnam to present with involvement from Southeast Asia Evac, April 1975 to the Operation Restore Hope - Somalia. 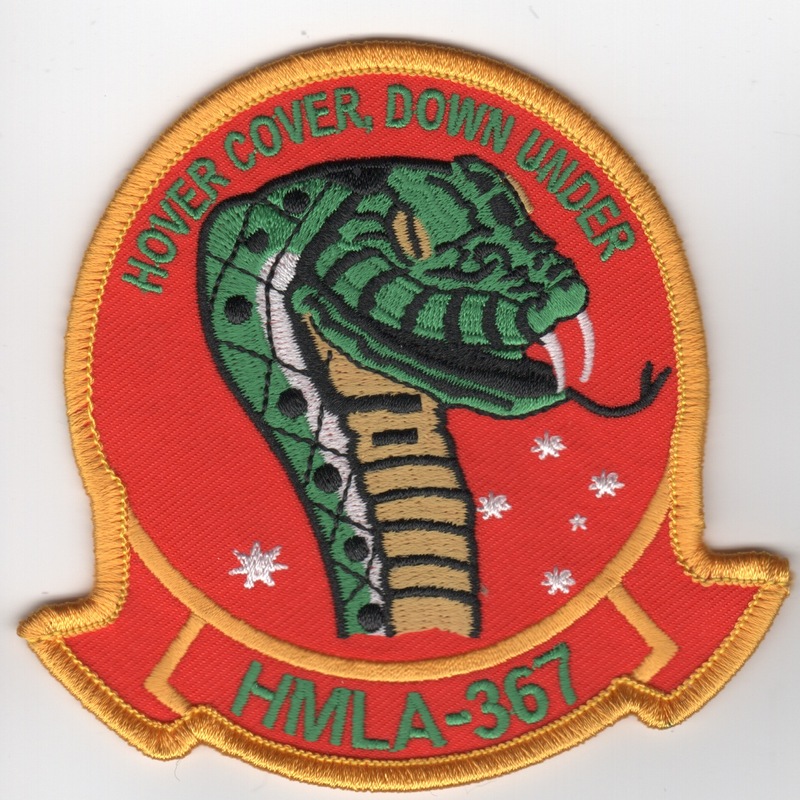 This patch was created for a detachment "Down Under" and says "Hover Cover, Down Under" showing the Cobra-head of their mascot. 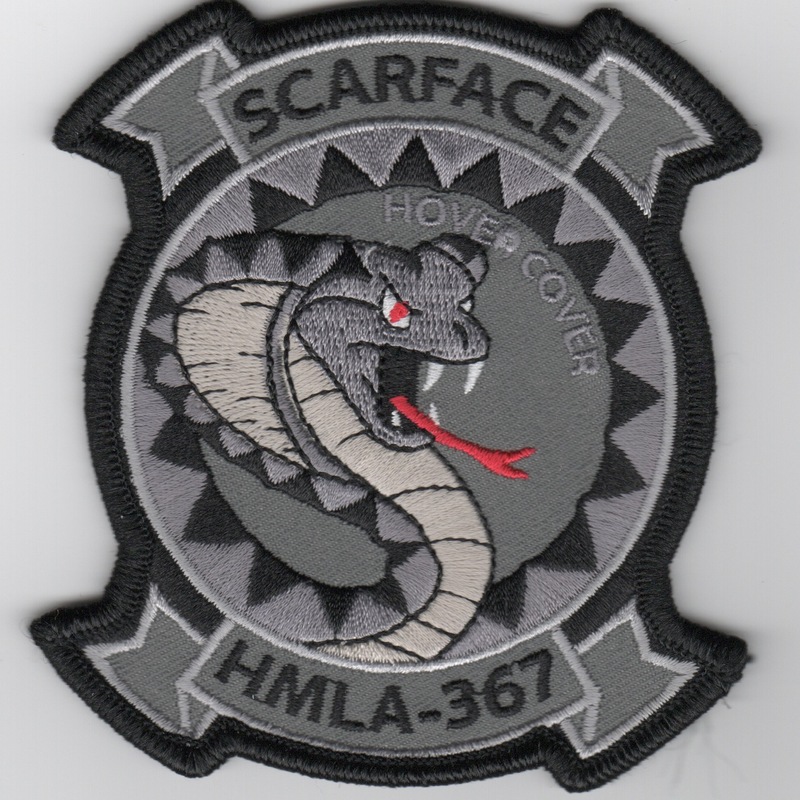 This is the "gray" version of the "Hover Cover" series of patches for HMLA-367. They are attached to MAG-39 located at MCAS Camp Pendleton. Their lineage is from VMO-351 (1943), then redesignated as VMO-3, 15 Jan 1944, then deactivated 20 August 1949. They were reactivated as VMO-3, 1 August 1966 and changed to HML-367, 24 March 1968. They were redesignated HMLA-367, 1 January 1988. This unit is a highly decorated unit from Vietnam to present with involvement from Southeast Asia Evac, April 1975 to the Operation Restore Hope - Somalia. 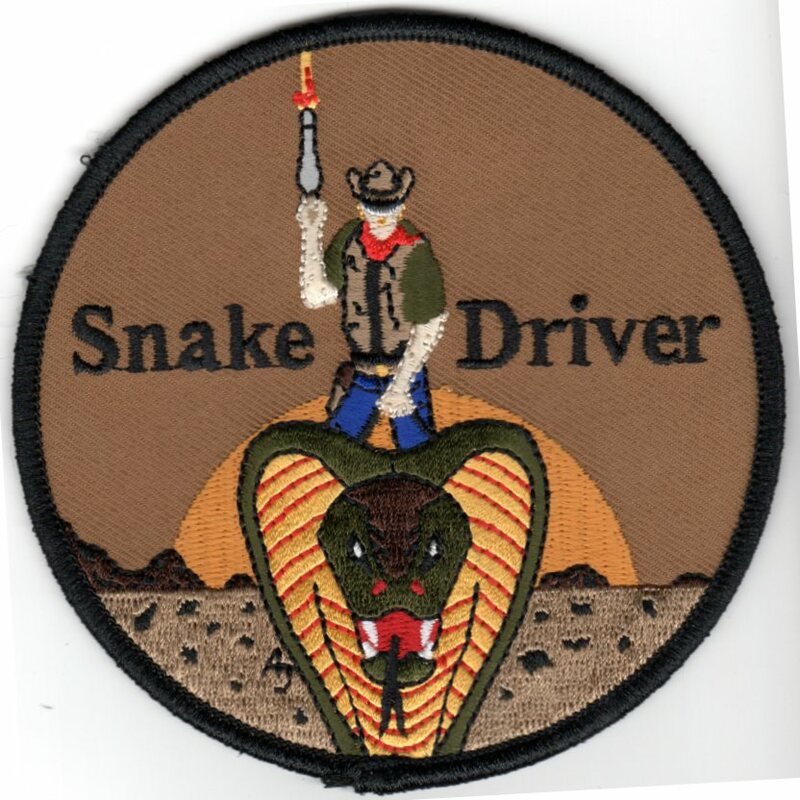 This is the "desert" version of the "Snake Driver" patch depicting a cowboy ride a Cobra snake with "Guns A-Blazing"....Not sure of the story behind it, but a neat patch. It does not have velcro attached. 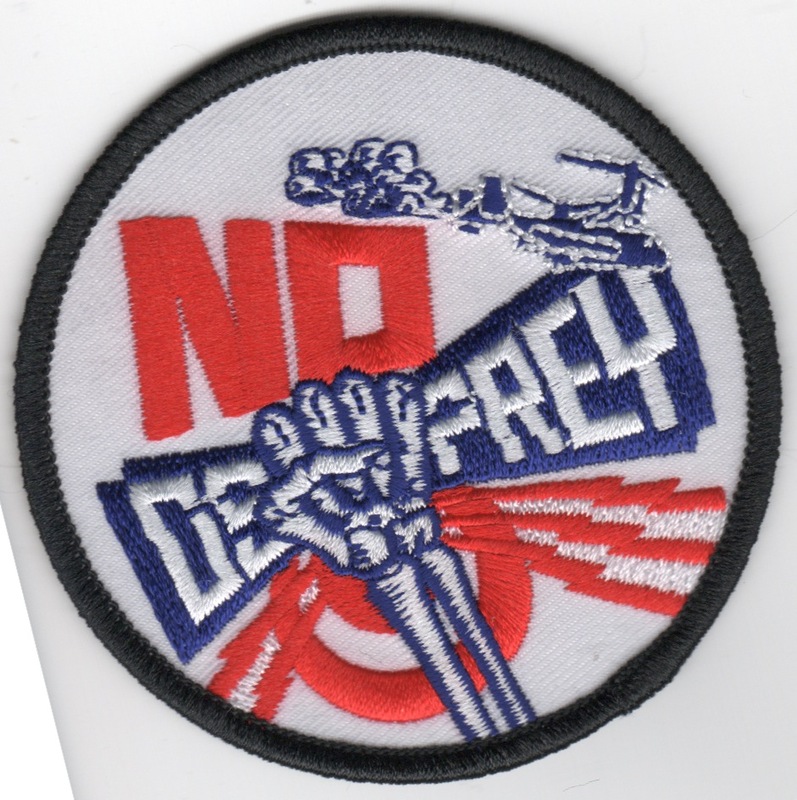 This patch says "NO OSPREY" and shows a skeletal hand crushing the letters.....I guess they don't want the Osprey! This patch does not have velcro. 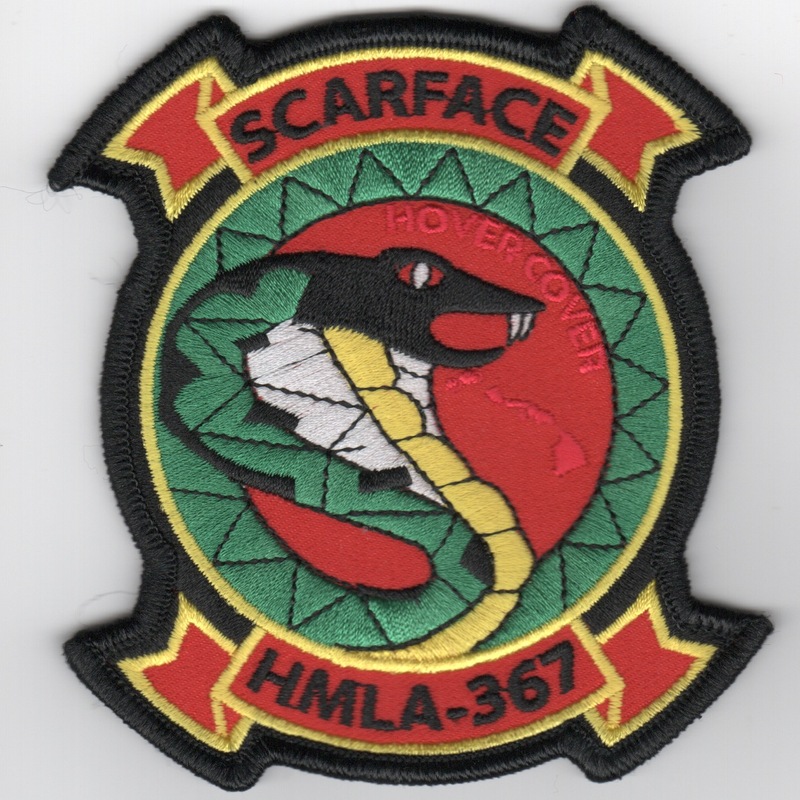 This is the "callsign" patch for HMLA-367, stating "Scarface 33". They are attached to MAG-39 located at MCAS Camp Pendleton. Their lineage is from VMO-351 (1943), then redesignated as VMO-3, 15 Jan 1944, then deactivated 20 August 1949. They were reactivated as VMO-3, 1 August 1966 and changed to HML-367, 24 March 1968. They were redesignated HMLA-367, 1 January 1988. This unit is a highly decorated unit from Vietnam to present with involvement from Southeast Asia Evac, April 1975 to the Operation Restore Hope - Somalia. 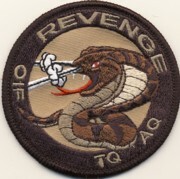 This is the OIF patch for HMLA-367. They are attached to MAG-39 located at MCAS Camp Pendleton. Their lineage is from VMO-351 (1943), then redesignated as VMO-3, 15 Jan 1944, then deactivated 20 August 1949. They were reactivated as VMO-3, 1 August 1966 and changed to HML-367, 24 March 1968. They were redesignated HMLA-367, 1 January 1988. This unit is a highly decorated unit from Vietnam to present with involvement from Southeast Asia Evac, April 1975 to the Operation Iraqi Freedom - Iraq. 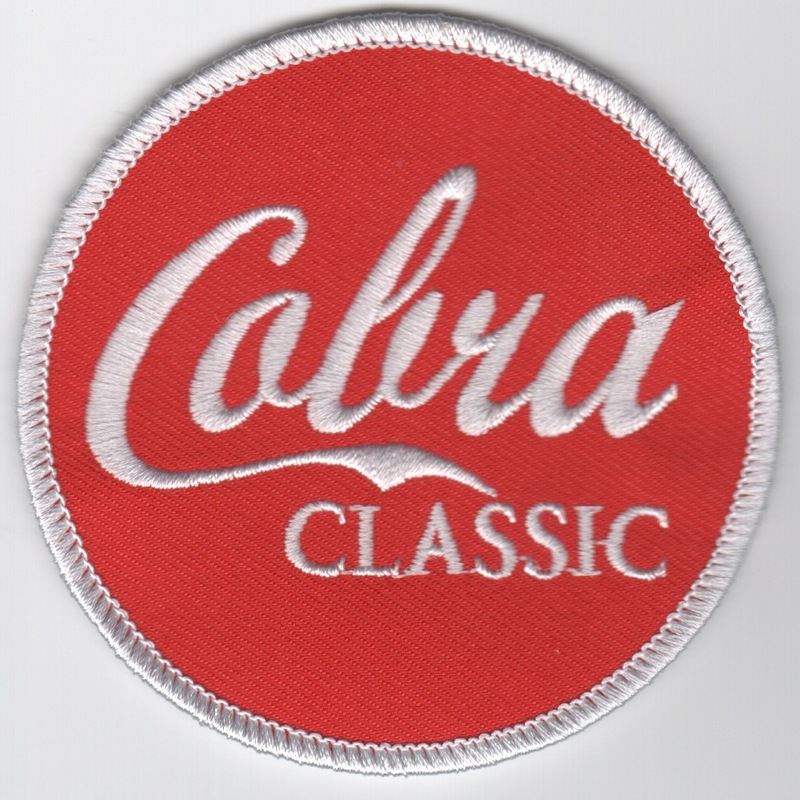 This patch says "COBRA Classic" in the same style as Coca-Cola.....not sure why! 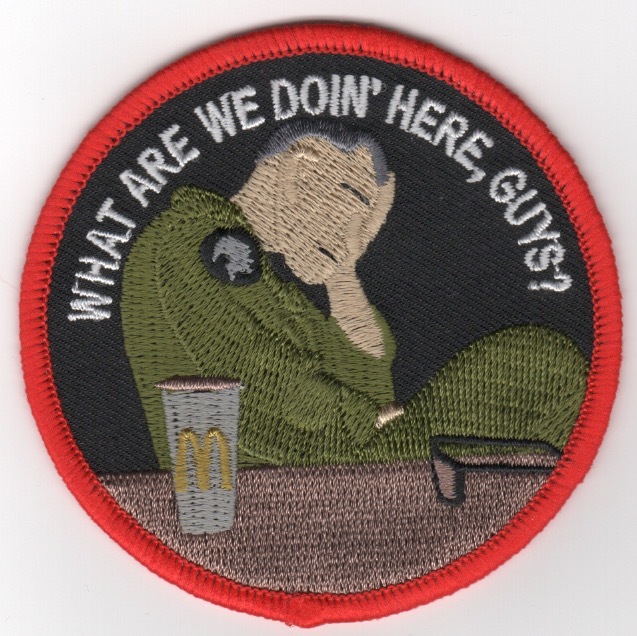 This patch says "What Are We Doing Here, Guys?" and has a McDonald's cup on the desk....This patch does not come with velcro attached.